Rich, dark treacle and muscovado sugar give this moist loaf cake its irresistibly sticky texture and full flavour. It keeps well for several days wrapped in greaseproof paper and foil, and stored in an airtight container. If you cannot wait that long, serve it freshly baked and still warm so the ginger butter melts over each slice. Preheat the oven to 170°C, gas mark 3. 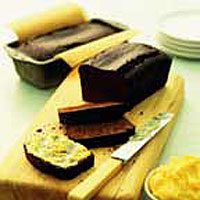 Grease 2 x 450g loaf tins and line the base and long sides with a wide strip of baking parchment. Place 125g of the butter in a mixing bowl with the sugar, flour, spice, treacle and eggs, and beat with an electric handheld whisk for 1-2 minutes until smooth and slightly paler in colour. Blend the bicarbonate of soda with 1 tablespoon of cold water and stir into the mixture. Divide the mixture between the tins, then bake for 1 hour until risen and firm to the touch. Leave to cool in the tins for 10 minutes then transfer to a wire rack. Beat the remaining butter in a bowl with the stem ginger, then transfer to a serving dish. Serve the loaf warm or cold, sliced for spreading with the ginger butter. Cook's Tips: Avoid opening the oven during baking as the drop in temperature could cause the loaves to sink in the centre. Do not worry if they do sink slightly - they will still taste as good. You can freeze the loaves for up to 3 months wrapped in foil or greaseproof paper. Avoid opening the oven during baking as the drop in temperature could cause the loaves to sink in the centre. Do not worry if they do sink slightly - they will still taste as good.